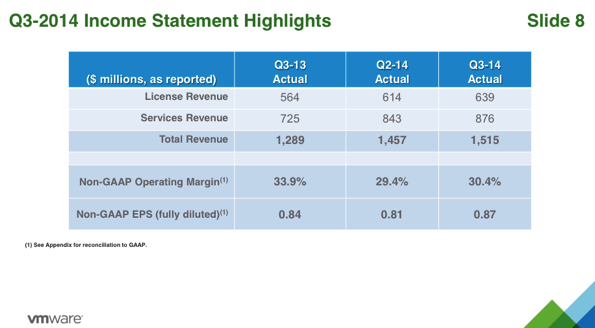 In their Q3-2014 VMware results for shareholders, the revenue from “services” is 30% larger than licensing revenue. This slides show a total revenue of $1.5B for the quarter but license revenue is only about 42% of total revenue, the bulk of revenue is services. 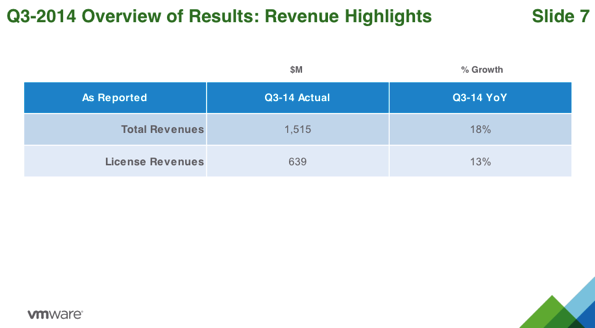 And this next slide shows that total revenue is growing at 18% while license revenue is growing at 13%. Another data point: VMware recently hired Dom Delfino away from Cisco to manage the delivery of professional services. Any Impact For Customers ? why does VMware have so much revenue from engineers or services ? where this revenue is coming from ? Is is maintenance/support or directly provided consulting services ? if VMware is planning to grow professional services revenue in the same way that Cisco says, then what does that mean for resellers ? will VMware offer me consulting services and shove them down my throat during the next sales cycle ? What would be the value to my business of these services if they were offered ? Is VMware over-charging me for maintenance ? The growth of service is larger than licensing. So, discounting of licenses or increases in software maintenance ? As they used to say on Saturday Morning television, “Answers on a Postacard, please” (or use the comments below). So perhaps this is a general trend? It’ll be interesting if F5 services surpass the 50% mark this year. Cloud design services could be growing and prices of products could be falling. Just a thought. Services will include consulting and support, but is it possible that services also includes VCloud Air? they have signed over $100M of that since they launched the service. Some interesting points I hadn’t considered, thanks.